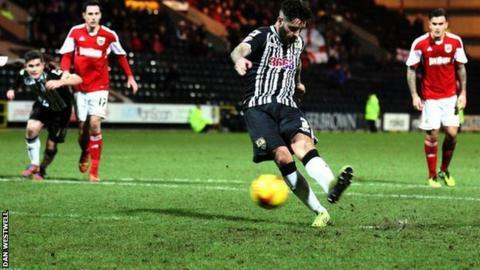 Alan Sheehan's last-gasp penalty earned Notts County a point against fellow League One strugglers Bristol City. The Robins, who saw Louis Carey make a record-equalling 645th club appearance, seemed set to climb off the foot of the table thanks to Sam Baldock's penalty. But Notts defender Dean Leacock made amends for pushing Aden Flint to concede the first-half spot-kick. Leacock was held by Marvin Elliott and Sheehan netted from the spot to ensure City stay bottom of the league. Carey has become joint record holder with John Atyeo. "I think it was probably a drawn game. When you look at it all the stats stack up as possession even, they had probably two more shots than we had as well as one more corner. "[They were] two of the softest penalties that you'll see. Ours was a soft one if that was a penalty he should have given us two. "We could have gone in at half-time 3-0 up. We've had two great chances before the goal, and if we put them away then it's a different game completely. We do have to be more ruthless when we get our chances." Match ends, Notts County 1, Bristol City 1. Second Half ends, Notts County 1, Bristol City 1. Enoch Showunmi (Notts County) hits the left post with a left footed shot from the centre of the box. Attempt saved. Marlon Pack (Bristol City) right footed shot from more than 35 yards is saved in the top centre of the goal. Attempt blocked. Scott Wagstaff (Bristol City) right footed shot from outside the box is blocked. Foul by Jack Grealish (Notts County). Greg Cunningham (Bristol City) wins a free kick on the right wing. Wes Burns (Bristol City) wins a free kick on the left wing. Substitution, Bristol City. Wes Burns replaces Jay Emmanuel-Thomas. Goal! Notts County 1, Bristol City 1. Alan Sheehan (Notts County) converts the penalty with a left footed shot to the bottom right corner. Marvin Elliott (Bristol City) is shown the yellow card. Penalty Notts County. Dean Leacock draws a foul in the penalty area. Penalty conceded by Marvin Elliott (Bristol City) after a foul in the penalty area. Corner, Notts County. Conceded by Greg Cunningham. Attempt blocked. Callum McGregor (Notts County) left footed shot from outside the box is blocked. Attempt blocked. Ronan Murray (Notts County) left footed shot from outside the box is blocked. Attempt missed. Callum McGregor (Notts County) right footed shot from outside the box is close, but misses to the left. Substitution, Bristol City. Marvin Elliott replaces Simon Gillett. Attempt blocked. Ronan Murray (Notts County) right footed shot from outside the box is blocked. Attempt saved. Derrick Williams (Bristol City) left footed shot from the centre of the box is saved in the centre of the goal. Attempt saved. Enoch Showunmi (Notts County) header from the centre of the box is saved in the centre of the goal. Attempt blocked. Simon Gillett (Bristol City) right footed shot from outside the box is blocked. Substitution, Notts County. Enoch Showunmi replaces Jamal Campbell-Ryce. Brendan Moloney (Bristol City) is shown the yellow card. Jack Grealish (Notts County) wins a free kick in the defensive half. Foul by Brendan Moloney (Bristol City). Attempt missed. Scott Wagstaff (Bristol City) right footed shot from outside the box is too high. Corner, Bristol City. Conceded by Alan Sheehan. Foul by Ronan Murray (Notts County). Louis Carey (Bristol City) wins a free kick on the left wing. Substitution, Bristol City. Brendan Moloney replaces Bobby Reid. Attempt blocked. Mark Fotheringham (Notts County) right footed shot from outside the box is blocked. Andre Boucaud (Notts County) wins a free kick in the attacking half. Attempt blocked. Callum McGregor (Notts County) right footed shot from the centre of the box is blocked. Corner, Notts County. Conceded by Aden Flint. Attempt saved. Jay Emmanuel-Thomas (Bristol City) right footed shot from outside the box is saved in the centre of the goal. Attempt saved. Jamal Campbell-Ryce (Notts County) left footed shot from the right side of the box is saved in the centre of the goal.